As many as 25 troops were missing and feared dead after Islamic militants armed with rockets overran a remote military outpost close to the Afghan border, the military said Wednesday. It claimed 40 attackers were killed in the fight. 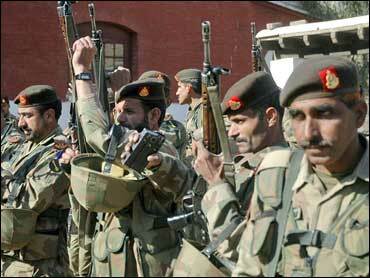 "About 200 militants charged the fort from four sides" late Tuesday, said army spokesman Maj. Gen. Athar Abbas. "They broke through the fort's wall with rockets." "Fifteen of the troops in the base escaped and they have reached (the town of) Jandola while 25 others have scattered and there is no news how many of them were martyred or fled," he said. The border region has emerged as a front line in the war on terror since Pakistan allied itself with the U.S. following the Sept. 11, 2001, terrorist attacks. Washington has given Pakistan billions of dollars in aid to help government forces battle militants. A total of 40 members of the paramilitary Frontier Corps were manning the post at the time of the attack, Abbas said, adding that government artillery was shelling the region. Forty attackers died in the assault, he said. It was not immediately possible to verify the army's claim. In the past, the rebels have given much lower figures for their own casualties. The outpost is one of several dozen such bases located along South Waziristan's mountainous border with Afghanistan. The U.S. hopes that elections set for Feb. 18 will help stabilize Pakistan as it faces rising attacks by militants. On Tuesday, Pakistan's government urged opposition leaders to refrain from holding rallies ahead of the elections, citing an escalating terrorist threat. Opposition leader Nawaz Sharif's party quickly rejected the recommendation, accusing officials of trying block the campaign against Musharraf. The squabble follows the Dec. 27 assassination of Benazir Bhutto, whose Pakistan Peoples Party is expected by many to emerge as the parliament's largest after the Feb. 18 elections. Musharraf has been criticized for alleged security lapses that let suspected Islamic militants launch a gun and suicide bomb attack on former Prime Minister Bhutto as she left a campaign rally. It was one of more than 20 suicide bombings in Pakistan in the past three months. The Interior Ministry issued guidelines to political leaders Tuesday "for their safety and security." These included recommendations to inform authorities of their movements. "It is of paramount importance that the political leadership is sensitized about the looming threat and asked to adopt a security conscious approach," Interior Ministry spokesman Javed Iqbal Cheema said. "Big rallies should be avoided as much as possible." Large rallies have traditionally been the main way to drum up support in election campaigns. Sharif's Pakistan Muslim League party denounced the guidelines. Party spokesman Ahsan Iqbal accused authorities of "playing with terrorist threat to stop opposition parties from reaching out to the people." "This is a failure of Pervez Musharraf. If he resigns, the law and order situation will become normal," Iqbal said. "This is intended only to stop the opposition from campaigning."